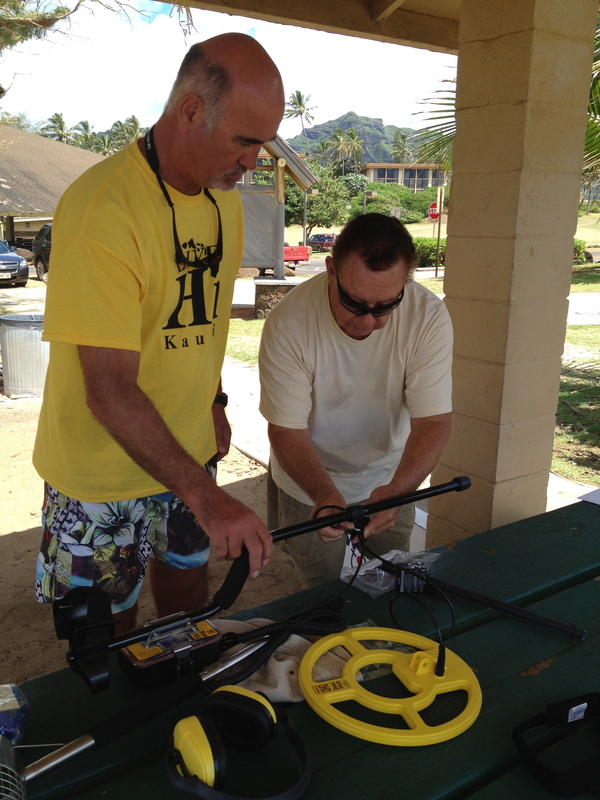 Steve has a new hobby on the island, and a new toy: a metal detector. Ah, but … not just any old Joe Schmoe metal detector! Oh no! 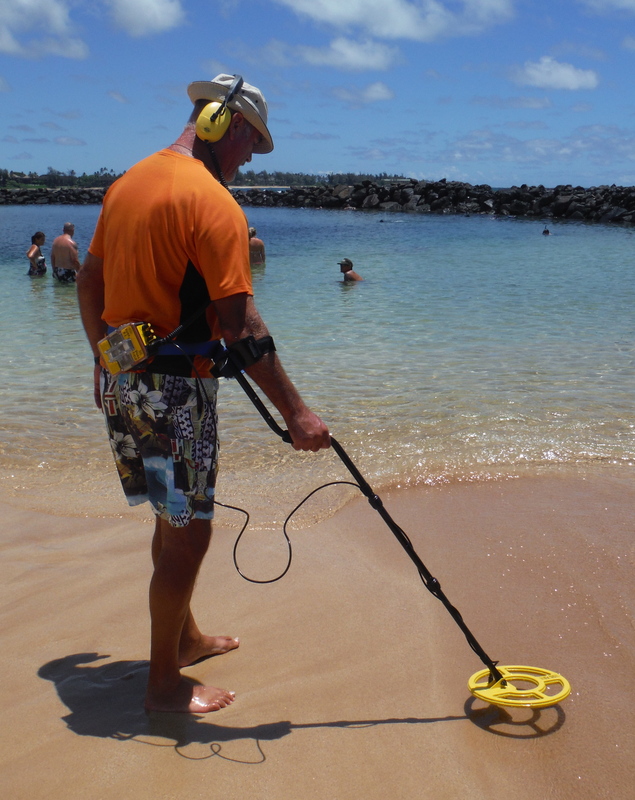 This is the White’s Surf PI Dual Field metal detector! Oh yeah, baby! His purchase earlier this year included a meeting at Lydgate Beach Park with the White’s agent on Kaua‘i, Dutch Medford … as it turned out, a two hour ‘meeting’ that was part instructional and part browsing through Dutch’s impressive ‘portfolio’ of finds, listening to some amazing stories. Admittedly his album extends over decades, but it was fascinating to see the amount of valuable and sometimes historic items he’d uncovered. Since then, Steve’s taken occasional metal-detecting strolls along a few of our north shore beaches, usually with me and the purpose-made scoop (Dutch’s invention) at the ready. Steve has left his card with the local hotels, which have beach fronts, as it’s not uncommon for visitors to lose valuables on the beach, particularly in the water. Let this be a lesson to everyone: NO jewelry on a beach day. Fingers do shrink and rings, even if you think they are too tight, do drop off, earrings can easily be dislodged if you fall off a surfboard or SUP board, clasps on necklaces, bracelets, and watches can come undone. Just don’t risk it, no matter how cool you want to look on the beach! 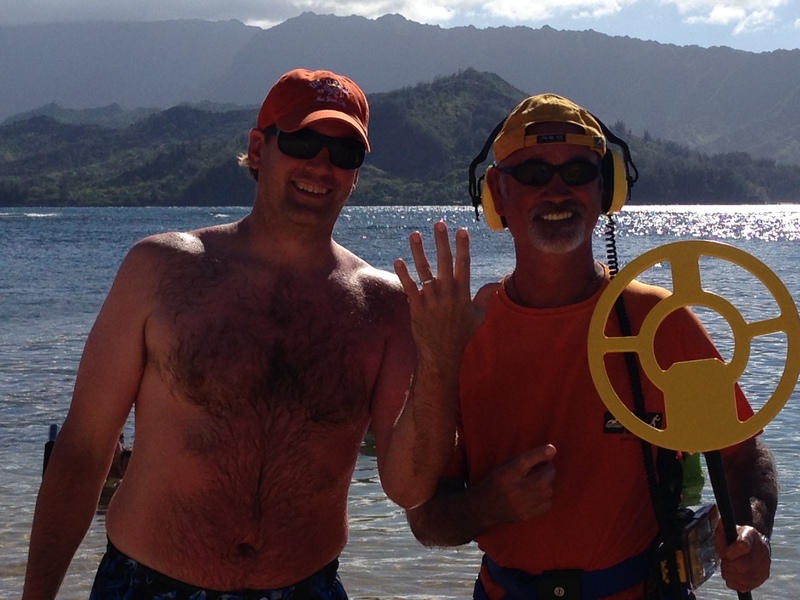 Around the time that Steve acquired his metal detector, a canoe club friend of mine was mourning the loss of her husband’s wedding band that had dropped off his finger some weeks earlier while bodyboarding somewhere along Hanalei Bay. Steve tried on two occasions to find it, but unfortunately the area they could pinpoint was too vague, and so far we’ve had no luck with that one. 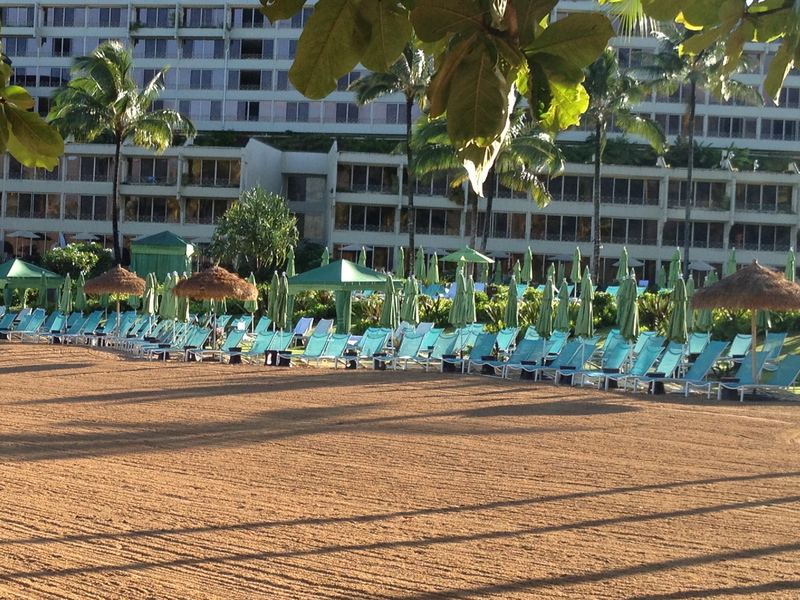 However, a couple of weeks ago, Steve received a phone call from a visitor staying at the Princeville St. Regis. Married on Saturday, lost his wedding band on Monday! Not the most auspicious start to married life, and certainly likely to cast a permanent shadow on the honeymoon. The following afternoon Steve met him on the beach. Luckily, he was able provide the exact location, because he had felt the ring slip off. Yet, despite that immediate awareness, his two hour search with (according to him) 20 others the previous day had been unsuccessful. Needles and haystacks come to mind. Not surprisingly, the poor chap was pretty forlorn; I’m assuming his bride was none too pleased with the situation. Steve waded in and was prepared to spend a couple of hours with him searching the area, but it took only 10 minutes to rescue the band from the clutches of the Pacific! Elation and effusive thanks followed … and that truly is the ultimate satisfaction of metal detecting. To see that look on someone’s face when you can return a personal item to them, particularly something that holds far more value than mere dollars. Steve was chuffed to bits, having converted that couple’s honeymoon from a dismal memory into a happy story to tell the grandkids one day. The grateful groom rewarded Steve generously for his efforts, which was kind of him since nothing was expected. Dutch advised us that Hawaiian law is specific in this area: if someone asks you to find something for them, then its their property and they owe you nothing (though it’s great to be given something for your trouble, or at least to cover expenses). However, anything that you find when searching an area for yourself is yours to keep … even if someone approaches you after the fact and claims the item is theirs. A beachcomber has no duty to find the owner or return the item; though, as Dutch confirmed, part of the fun of the find is tracking down the owner and reuniting them with something they assumed was lost forever. I’ve started a photographic record of all Steve’s finds, starting with his very first cent, and I was particularly delighted to add this special item to the album!